This is Acolin, a 23-year-old Japanese specialty school student. Her doll-like look caught our attention right away when we spotted her in Harajuku. Acolin is wearing a green Liz Lisa dress with red stockings that match her long red hair, and penny loafers from a vintage shop. For a bag, she’s carrying a large red vintage quilted purse. Inside of her purse, she had a pair of headphones, as you can see in the last photo. 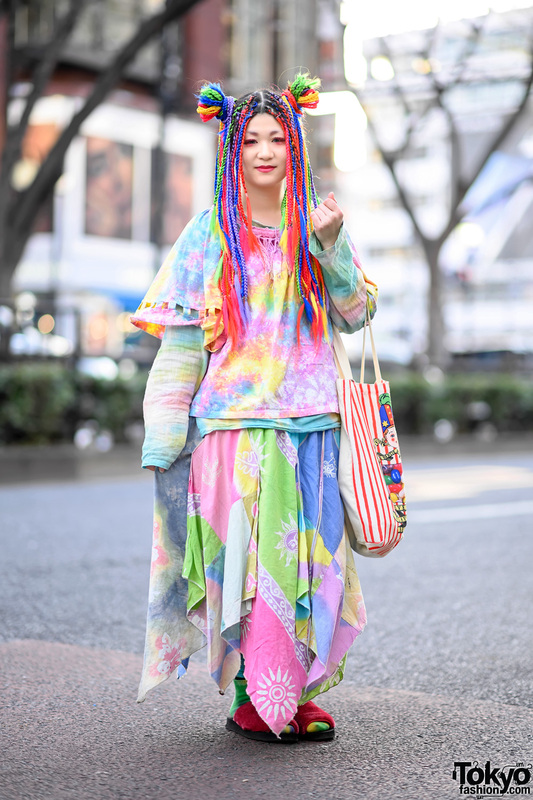 Acolin told us that some of the accessories she’s wearing are from her favorite brand, Harajuku’s very own Milk! Isn’t it just a wig- on the last pic, it doesn’t look like her actual hair. its her hair plus extensions. i love the colors and her bangs are perfect! It looks like she’s wearing extensions. She looks very cute, though! aside from the shoes (loafers look weird on me). that girl (hair cut and color too) dresses exactly like i do. it’s kind of surreal to see. I love her hair and colour and it’s so cool that stockings match ! Her outfit is cute too!!! A great outfit! Love the coat, shoes and her hair colour! Great use of colours and velvety feel.